Mother Clucker have announced a new residency at The Shacklewell Arms to last until the end of June. I ate their chicken when they were at The Endurance, and loved it. No tickets - just turn up (hungry). "Mother Clucker landed firmly on London's palettes back in March with a hugely successful six week residency at Soho’s favourite boozer, The Endurance. Londoner's flocked to savour the moreish authentic MC delights and today we announce its anticipated return at The Shacklewell with a six week residency. Also now confirmed is MC’s appointment as official backstage food vendor at London's favourite indie-electronic festival, Field Day. The Mother Clucker ‘Shack’ features a brand new menu set to get those taste buds tantalized, packed with tried-and-tested favourites and experimental new dishes. 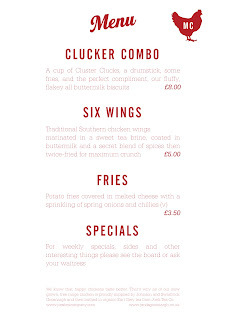 The starring dish comes in the form of the Mother Clucker Combo featuring a cup of Cluster Clucks, French-trimmed drumstick, handmade fries and an American biscuit - a well-rounded, hunger-busting meal. 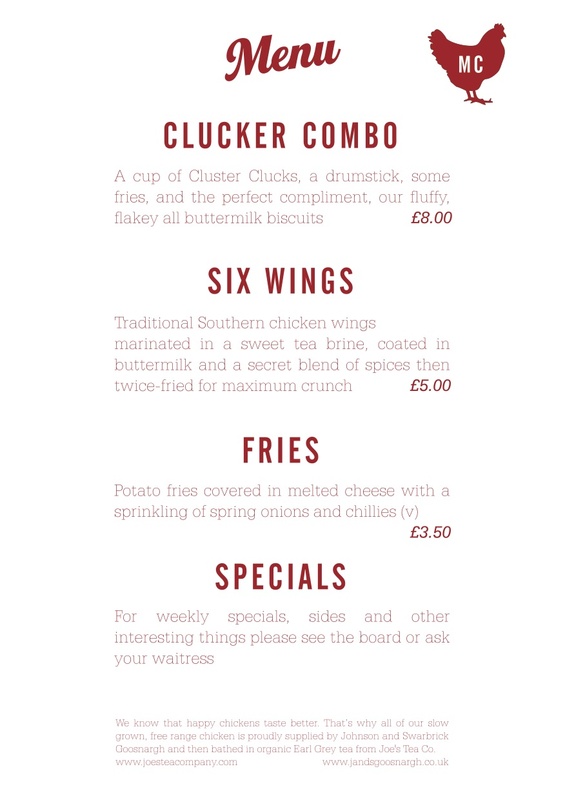 The crunchy chicken wings and potato fries covered with melted cheese and a sprinkling of spring onions and chilli are also featured on the new menu. Additionally a number of sides will be available on blackboard rotation, including crowd favourite battered jalapenos, sweet corn on the cob, creamy coleslaw, potato salad, sweet potato and corn fritters and customary Southern Hush Puppies – savoury, deep-fried, cornbread balls. A number of rotary specials will also be on offer, from indulgent macaroni cheese served with jalapeno cheese and collard greens, to a hearty pea stew cooked with a special creole sauce served with rice and greens and the ultimate chicken burger, fried chicken breast layered with homemade American jalapeño cheese and hot sauce in a biscuit bun served with handmade fries. With fast food this good, there will be no need to go to a chain impostor ever again! Using only the finest ingredients, from free-range chicken hailing from Johnson and Swarbrick Goosnagh's farm, handpicked herbs and spices from Spice Mountain and premium tea from Joe’s Tea, Mother Clucker’s ultimate comfort menu is quality fast food as it should be."